10.17.2014. Getting my computer organized to do some "Mad" entries while we travel. Discovered that Google keeps track of my every move, so with a quick visit to maps.google.com/locationhistory and a screen capture (see above), I have an automatic map of our day's travels, including the report that we traveled 343.783 miles. * Cool, in a creepy sort of way. 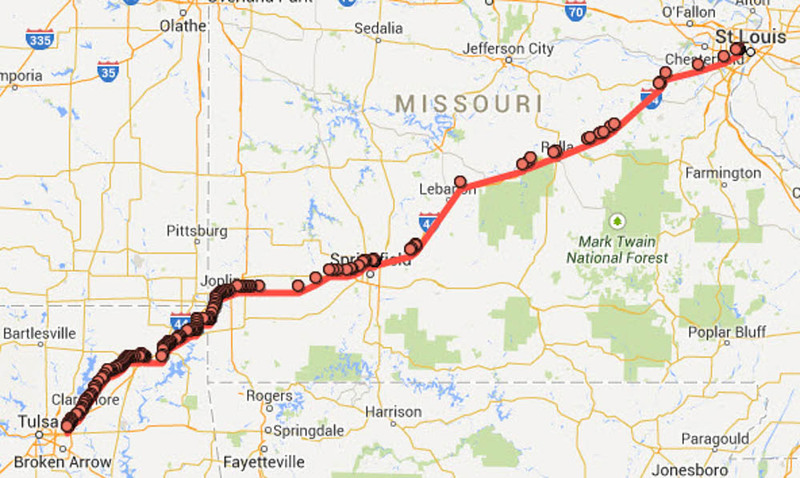 We had a whirlwind couple of days in St. Louis. My mom's house is tiny but nothing beats the kitchen table for those intimate discussions of politics, religion, and family gossip. 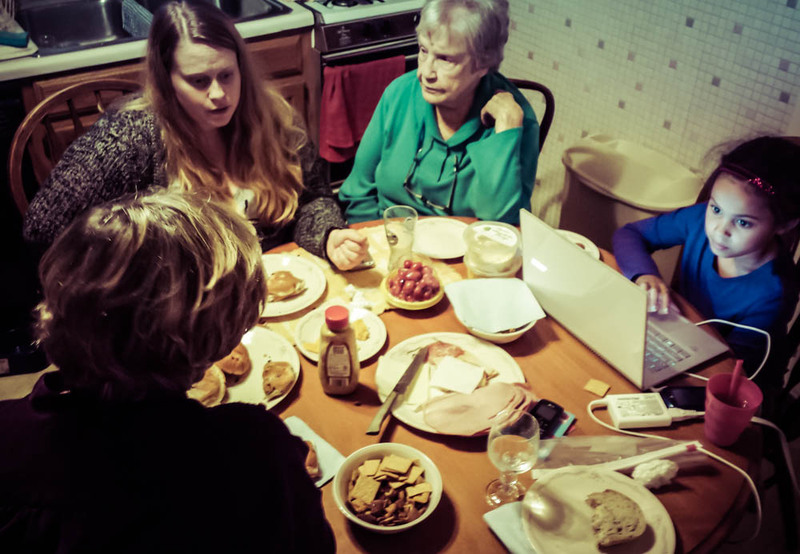 Below, discussing the Ferguson issue with sister Ellen, niece Rebecca, and Mom, while grand-niece Bri found better entertainment online. The living room is hardly better, with never quite enough room for everyone. It keeps at least one person on her feet replenishing drinks and snacks. 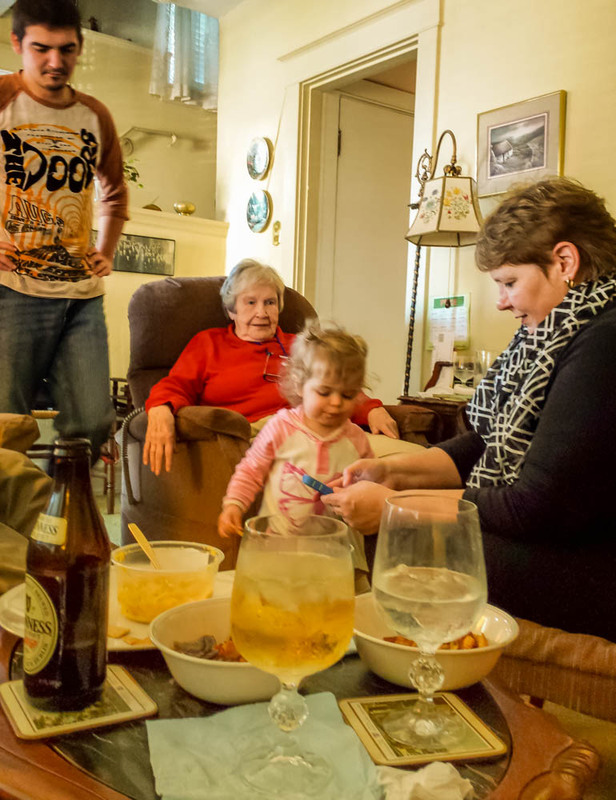 Below, nephew Sam and Mom look on while sister Kathleen provides grand-niece Maya with her iPhone dance music. Happily, we saw almost everyone, including my brother-in-law Bob, just out of the hospital from heart surgery. We missed Tom McD, Debbie, the away-at-college boys, and flu-infected Molly (except for a drive-by mercy call to deliver her some Thera-Flu and chicken soup). We stood by to witness the Cardinals' World Series hopes go down in 9th-inning flames. Three nights in the Lou, and, after big hugs to my dear brother Tom and my darling old mom, off we drove -- fast tracks across Missouri to Oklahoma, where we slowed down to take in the October-dry landscape of mown hayfields and grazing pasture. The low sun made everything glow. *Our odometer pegs us at 383 miles today. Wonder what accounts for the difference.